The MHS Board meets the third Thursday of the month at 9:00 a.m.. Pratt Hall in the summer, Public Safety Building Conference Room in the Winter. 1. What proportion of the total value of Montgomery's Grand List value is owned by town residents? 2. What is the state average for resident ownership? 3. VT currently has about 262 cities, towns and villages. How many were granted by Gov. Benning Wentworth of New Hampshire? 4. In 1902 the Local Option Party came close to ending the Republican strangle hold on the governorship. What was their key policy? Statutory changes established property tax exemption categories but there was not a clear exemption for organizations like ours. The State Tax Department eventually advised our local Listers that Society property was exempt under the section for "public, pious and charitable" organizations after we provided copies of our bylaws. Phew! Ominously the State revised the law this year and eliminated the exemption category for fraternities and sororities meaning they now must pay property taxes. You may have seen or read about their ongoing appeal. If our Society ever loses this exemption it would be an existential crisis. It could take well over 50% of our normal annual revenue, which is mostly membership donations, just to pay our property taxes. In another twist, the Vermont League of Cities and Towns (VLCT), the principal lobbying organization for VT municipalities, recently urged law makers to extend the Open Meeting law, and laws related to records accessibility and retention, to non-profits. The mayor of Burlington reasoned that since non-profits get tax breaks they should follow the same rules as governmental organizations so people know how they are running things and spending their money. While this sounds good in theory the practical impact would make it incredibly hard to do business, specially for small organizations without any staff. Everything from quorum rules to restrictions on email would come into play. To its credit, the legislature has given the idea a cool reception. To be clear, the Society has both Federal and State exemption status. We pay no income or property taxes. This enables us to serve our community. Our bylaws forbid us to lobby as an organization for legislation, or engage in other political activities, like elections, otherwise we could jeopardize our tax exempt status. As individuals we can all let our representatives know how we feel though. This year's commemoration will be at the Montgomery Village Cemetery. It will be on May 30th at 11:30 a.m. It will feature a remarks, roll call, honors by American Legion Post 42, and refreshments. Please join us to pay our respects to those gave their lives serving our country and all those veterans interred in Town. We are making arrangements for the final West Wall painting, and bell and clock tower repairs this summer. 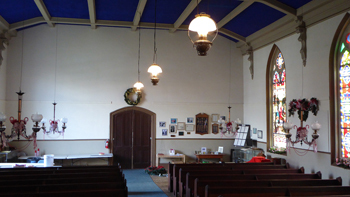 In the meantime the Board approved raising the center aisle's electrified lanterns (see picture below). These were low enough to hit heads and obstructed the view of the stage / chancel area. Thanks to Steve Hathaway for cutting and re-bending the long steel hangers. The lanterns are now three feet higher and look great, even enhancing the appearance of the kerosene lanterns. For those who haven't already.... If you bank with TD Bank there's an easy way to support us. Just call them and ask to have the MHS be your Affinity Program organization. It costs you nothing, but the Bank will make an annual donation based on your, and others, account balances. Thanks to our membership participation in this program we have received nearly $40,000 since 2010! 1. c. Montgomery residents own 60% of the Town's grand list value. 2. b. State residents own 56% of the State's grand list value. 3. b. Wentworth granted 129 towns. 4. The Local Option Party advocated prohibition should be determined on a Town by Town basis. Pat Farmer, Elsie Saborowski, Jo Anne Bennett, Tim Chapin, Patty Perl, John Beaty, Mark Baddorf, Bob Cummins, & Andre Labier. Effective in February the MHS Board meets at 9:00 a.m. on the third Thursday of the month. This is our regular business meeting where we review financial, membership, program, building and other issues integral to keeping our organization moving forward. The public and membership are always welcome, although the mimosas and German cake served at the inaugural meeting may not be there. Hey, as Ben and Jerry say, if it's not fun why do it? We were all saddened by the news of Ken's passing in late January. Ken didn't care for our Board meetings but was always there when it came to our self help projects. The reinforcement of the church floor and new entry steps, and deck carry his sweat and tears. We will all miss him. Our best wishes to Jaye and all of his family. 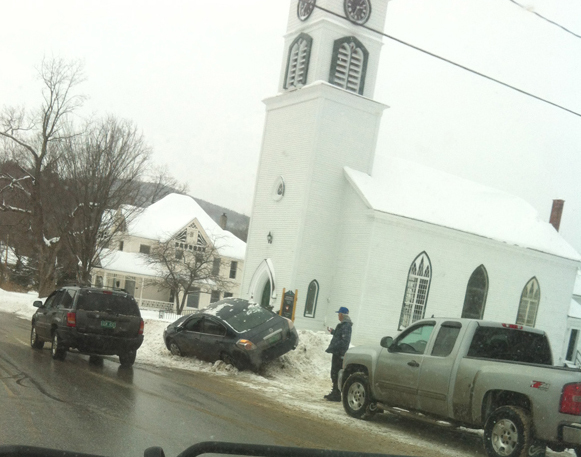 Last winter a car didn't make the corner and ended up atop the snow bank in front of Pratt Hall (see below). This winter another car lost control and hit one of the flower barrels out front, just missing the new ramp and railing. The frozen half barrel totaled the car! Some may remember the summertime incident that took out our sign, handicapped ramp railing, and came to rest just touching the corner of the building. Our guardian angel deserves our gratitude but maybe we need to get more flower barrels! The next order of engraved walkway bricks will be placed soon and installed in the walkway in May. If you would like to order in time for May please contact Pat Farmer ASAP but no later than April 20th. You can also order on line at our History for Sale link. You should receive a letter soon, if you haven't already, asking you to renew your membership or become a new member. Annual membership donations are used for our operating expenses and programs. You can mail us a check with the handy return card and envelope or join via our website and make your membership donation using a credit card (processed by Paypal) or a Paypal account transfer. This year's MHS Annual Meeting will again be part business and part celebration. Here's our TENTATIVE plan. We will be having social time starting at 6:00 p.m., then a short business meeting, and then, hopefully, move to the newly re-opened Black Lantern for a sit down meal. Seating will likely be limited so please stop by and see Elsie for reservations or call at 326-4528. We will get out more information and invitations once we nail down the details. The Board approved and submitted an award nomination package to the Preservation Trust of Vermont (PTV) for our West Wall project. PTV usually makes these Preservation Honors Awards every two years. We won one of these in the 1980s for the rebuilding of the bell and clock tower. A 2010 nomination for the structural work on the base of the tower and entryway fell short. 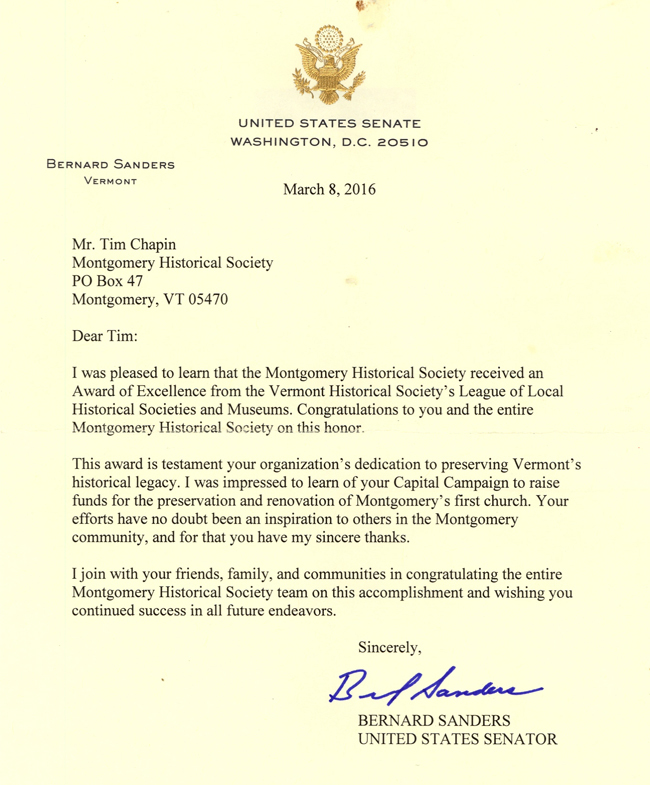 If this nomination is approved it will be presented at the PTV Annual Meeting in Waterbury on June 10th. Wish us luck. April: 1865 Morris Braman dies. Last man from Montgomery to die in the Civil War. 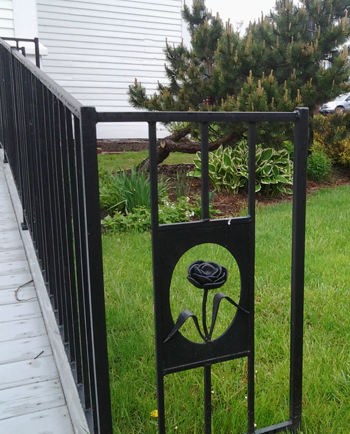 May: 1993 Black Lantern placed on the National Register of Historic Places as Montgomery House. June: 1923 Modern VT State Flag adopted by legislature. The Town-appointed committee to study options and develop recommendations for resurrecting the Hectorville Covered Bridge received a near final, draft report from the grant and Town-funded scoping study in February. The plan was to put the bridge up as a shelter, information kiosk, and pedestrian feature at the Rec Center near Montgomery Center. The engineer estimated a cost of about $550,000, of which $350,000 is direct construction costs. The Committee is considering additional options to try to pare down the cost estimate and will report back to the Selectboard soon. MHS Board member Pat Farmer is part of the group. The Board was contacted by relatives of Savanard and Sheldon Jewett after they attended our presentation on Montgomery's covered bridges at the Wild and Scenic Rivers event last fall. They wanted to know if the Society would be interested in displaying an informational plaque at Pratt Hall commemorating their bridge building kin. The Board agreed to work with them and we expect to receive a draft of a roughly 2' X 2' bronze plaque soon. Our initial thoughts are to locate it in the small garden spot to the left of the entry. 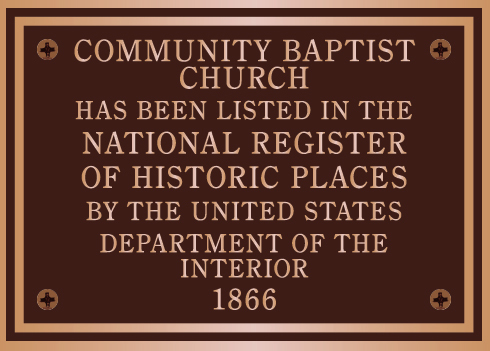 The Society purchased the plaque for Montgomery's newest National Register of Historic Places (NRHP) listee. 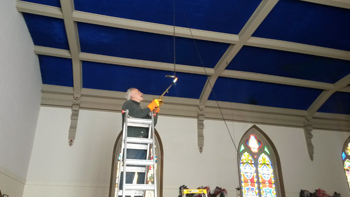 The Montgomery Town Association (MTA), the organization who owns and is caring for the church and parsonage, plans to unveil the plaque at it's Annual Meeting on May 18th. The meeting starts at 5:30 and the public is welcome. MHS Board members Sue Wilson and Marijke Dollois also serve on the MTA Board. May 4: Regional Society Meeting. 11:00 a.m. – 2:00 p.m. St. Albans Historical Society and Museum. May 18: Former Baptist Church. 5:30 p.m. Montgomery Town Association Annual Meeting. NRHP plaque unveiling. May 30: Montgomery Village Cemetery. 10:00 a.m. Annual Memorial Day Commemoration. June 3: Pratt Hall. 6:00 p.m. Annual Meeting. Details to follow. June 18 and 19, 2016: Tunbridge World's Fairgrounds, Tunbridge, Vermont! Vermont History Expo - H2O: The Power of Water in Vermont History!